College Coach? Click here to view all of Anthony (Tony)'s information. 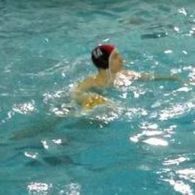 I've played water polo since freshman year of high school.I started as a freshman on the junoir varsity team playing as a utility player while at times filling in for the goalie.I do love playing the field however my home is the net. My sophomore year I was moved to the position of goalie for the varsity team. As a junior I continued to play goalie at the varsity level while beginning to train my replacement. Senior year I will also be the goalie and look forward to participating in assisting my team to conference champions. After winning conference my goal is to lead my team, the BHSD 228 Silver Snakes further in sectionals so we can compete in state. Next year my personal goal is to make the All-Sectionals team.Once high school is completed I look forward to the next phase of my education and athletic life changes.This includes participation in a competitive mens water polo league all along the while educating myself in a degree in engineering.